I started this travel month out at a Christian school in Lake Oswego, OR. I skated and gave the invite to know Jesus and a whole bunch of kids raised their hands… God is good! The kids were stoked on my skating which is the beauty of freestyle. People who don’t skate tend to like watching it more than the other stuff. The trip I had been looking forward to was immediately following that- Joliet, IL right outside Chicago. I got to see my good friend Pro Skater Elijah Moore and do an outreach together. Thousands were praying for Eli a few months back when his kidneys failed and he went into a coma for 10 days. He is still not able to do much on a skateboard but he can share his incredible story about the power of God in his life. That night in Joliet, we saw so many people come to Jesus. While I was still sharing my heart for the lost, kids began to come forward to receive Jesus, I’d never seen that before. The next stop was near Springfield,IL. I was invited to share and skate at a regional youth conference. This group actually stood up clapping and cheering several times during my skating, which got more stoked to do crazier stuff. My ministry there mostly took place in the one-on-one conversations that I had with students. I got to lead a young man to Jesus this morning before my flight who was waiting outside my hotel room to talk with me about his life. I am so thankful for this life I have in Christ Jesus. 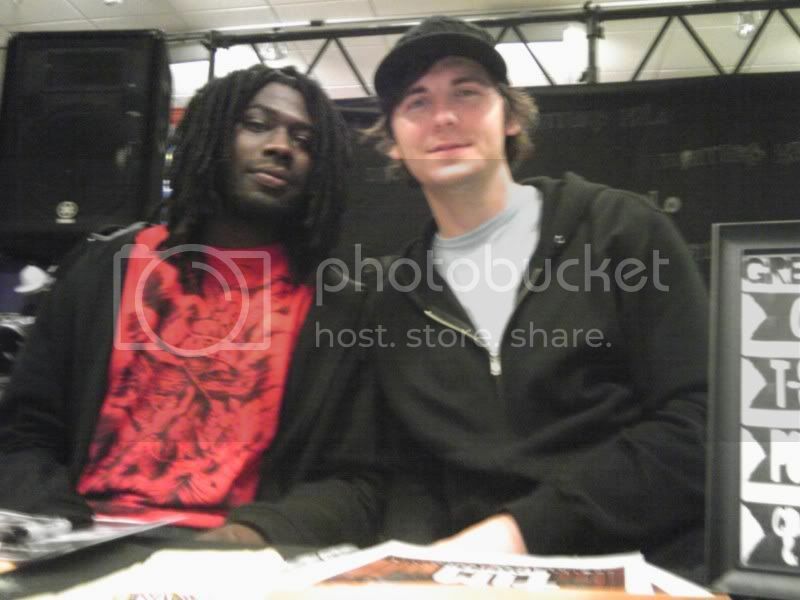 The pic is of Elijah Moore and myself during a signing at the local mall. I was thankful to see my friend once again. Thank you Tim for your words and your work! My sons best friend Danny came to God for the first time at 1st Assembly Fall Frenzy! His words were “I have never had anyone explain God to me in a way I could understand.” My heart was and still is crying for joy!! God is calling me to reach out to more and more youth who are lost, lonely, unloved and hurting! You are doing a mighty work for God!!! Keep going!!! And BTW my van still smells like the peppermint latte from friday night, lol! Thanks it is a VERY nice reminder of a fantastic night!